Back in December I was invited, along with other artists, by Ranger to create a something for the Ranger trade show booth for CHA. Each artist was sent a 12 x 12” wooden frame with a rounded edge and a selection of the new Perfect Pearls Mists and Perfect Pearls powders as well as a few other items like Sticky Back Canvas (which was already one of my favorite products on the market). I came up with the idea of what it would be like to have perfect vision of what one needs to be happy (I also thought it was a fun play on words since it was all about using Perfect Pearls products, but I am sure I am the only one who noticed) and started by making a list of words that might work to convey the message in 6 or 7 words. After I had a list of about 10 words, I gathered items that might work to visually convey the message. Love, of course was the easiest and compassion being the hardest to figure out. 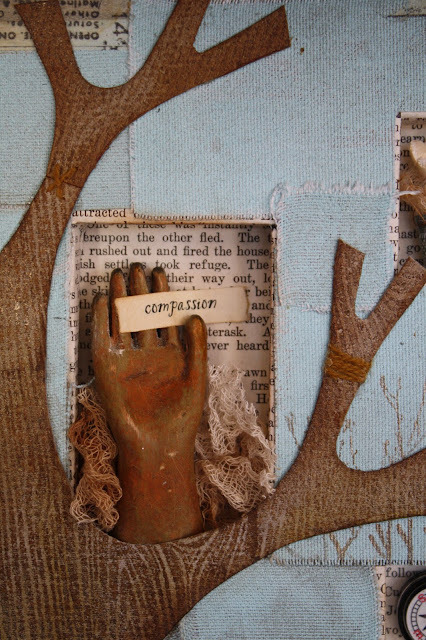 Thank goodness I went to the Tim Holtz class back in November where I was given the hand I used, as part of the kit. I like the piece way better in person than I do looking at it here on my monitor but that's okay since I am really here to show you the technique I used to create the background. 1. I wasn’t a fan of the rounded frame shape so I flipped the frame over and used the back as my front so that it appeared more like a canvas than a frame. 2. I cut 3 pieces of foam core to “fill” the center of the frame (a bit of glue in between). 3. While the glue was drying, I drew out a basic sketch of the tree on a piece of tracing paper, then used it as a pattern to cut the tree from Grungepaper. Once the tree was cut, I stamped it using a wood texture stamp (I think I have used that stamp about a 100 times on this blog) and Walnut Stain Distress Ink. I quickly dusted the tree with Perfect Pearls after each time I stamped the image to give a subtle shimmer to the tree (spray with water from a mini- mister to set and dry with a heat gun). 4. I used the tree to direct me to where the holes for the niches needed to be. I don't mean by psychic means, just that I laid the tree on the frame so I could see where the holes should logically be. I cut the holes all the way through the foam core and add the back later (remember, I had my items already picked out so I knew what size holes to cut). I lined all the holes with pieces of old book paper. I knew I was going to cover the foam core with sticky back canvas so I didn't have to worry about being neat. I use two colors of Caludine Hellmuth Studio paint (sky blue and blank canvas) and mixed them up on a craft sheet until I was happy with the color. Use a popsicle stick to get the paint out the jars so as not to contaminate the colors. You can paint the canvas directly or prime with gesso. I just painted it. Completely cover the canvas with the paint, but really no worries if there is some white showing. I am impatient so I used a heat gun to dry the canvas. That is one of the things I like about Sticky Back canvas, you can use the heat gun to dry paint and it does not effect the glue on the backing. Now it's time to have some fun! Break out the Perfect Pearls Mists...my favorite Heirloom Gold. Perfect Pearls Mists are mixatives (I have no idea if I spelled that right), meaning they have a tiny ball in the bottom of the bottle that is used to mix up the liquid when shaken. So shake, shake, shake till you hear the ball, then spray. Spray over the canvas. The spots appear dark but lighten as they dry. On some pieces of canvas I let the mist puddle and then sopped it up with a rag for a different effect. Dry with a heat gun. Snip a section with your scissors. When I made this project I painted 2 sheets of 12 x 12 canvas so I would have plenty to cover the frame. I ripped all the pieces at random widths from 1" to 3" and just used the pieces that worked. If you don't like the pre-cut edge on the canvas just snip about 1/2" from the edge to create a ripped edge on both sides. Smooth canvas onto the craft sheet. Don't worry it won't stick permanently. Break out the Perfect Medium and any stamp you like. I used this one. I prefer using red rubber stamps with this technique because the stamped image is more precise, but it will work with clear stamps. Pounce the Perfect Medium onto the stamp. As I said before, when I made the piece the strips were ripped in different widths so I could choose what part of the stamp to use depending on the size. NOTE: Before you stamp the image on the canvas strip have the color of Perfect Pearls Powder chosen and ready to go along with a brush. start brushing the powder over the image. Once you see some of the image you will know where to go to find the rest of it. Just keep moving the brush until you see it all. Try your best to brush away the excess since it has a tendency to want to rest in the weave of the fabric. Once the image was to my liking, I sprayed a fine mist of water using a mini mister and set with a heat gun (don't skip this part). Once I thought had enough strips to start layering on the foam core I began with larger 3" wide pieces, layering and cutting as I got to a hole in the foam core. It really is personal taste from here on out. Do what you think looks good to you and it will work out in the end. 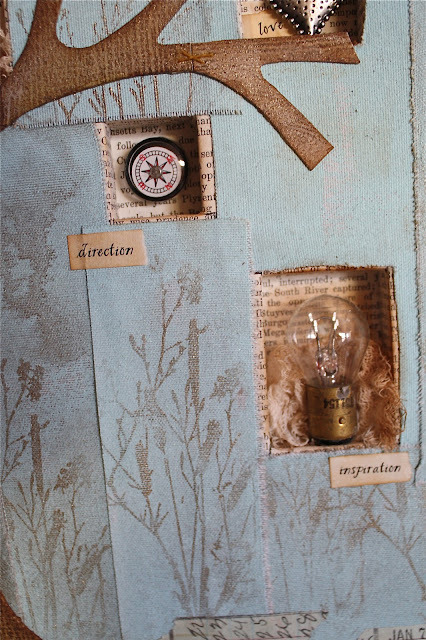 To make the holes into little niches for objects, I simply covered a piece of chipboard with book paper and strategically glued it to the back. Now all the holes looked like they were carved out of the wood frame. You might notice the wool thread on the tree limbs. When I got all the niches done, I wanted my tree to have longer limbs then planned so I cut off some limbs and moved them and made others just like the first, attaching with the wool thread X or wrapping to cover up the seams. I am not sure if you can tell but this is an upside down thimble from a Monopoly game I picked on my trip to Texas. 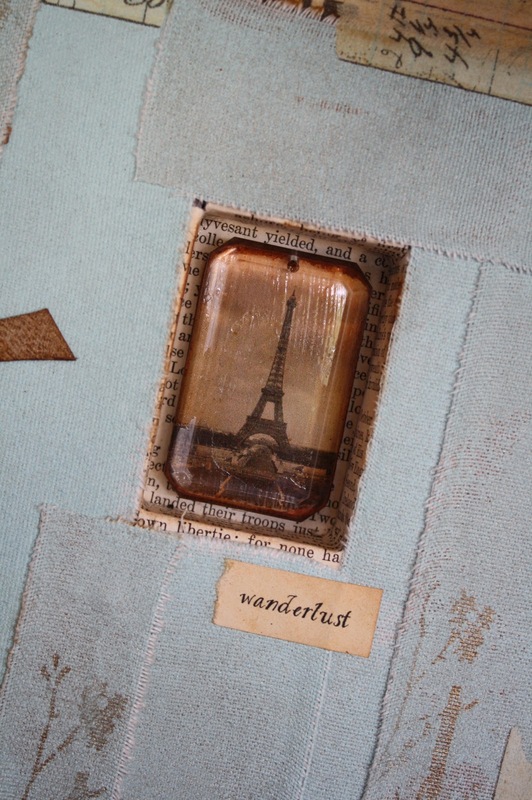 I adhered a little picture of the Eiffel tower to a piece of book board, sanded and inked the edges heavily, then used Glossy Accents to attach a Idea-ology Facet. I also used my favorite Therm O web 3-D squares to raise it up off the back. You might notice the spot to the left of the word, Direction. This is what it looks like when you let the Perfect Pearls Mist puddle. I tilted the canvas so that is would run a bit down the canvas and then sopped up the excess. I created a patch with some leftover pieces to represent forgiveness and stitched it on with some heavy red button and carpet thread. Sorry this post ended up so long...A couple of my friends Dina Wakley, Tammy Tutterow also were in on this challenge...love how we were all given the same challenge, yet each one turned out totally different (click on each name to see what they created for the challenge). If you are interested in all the participants pieces, they were posted this week on the Ranger blog here (scroll to Feb 18th for the 1st of 3 blog posts on the challenge). What a fascinating process to create this! Thank you so much for sharing how you did it. It is so beautiful. Wow! Love how this came out and how you used the back of the frame for the front. Very cool. Love, love, loved your project. So clever and full of meaning. You inspire me like mad Gypsy Girl! This piece of art is wonderful! Every little detail is a jewel! thanks for sharing with us! 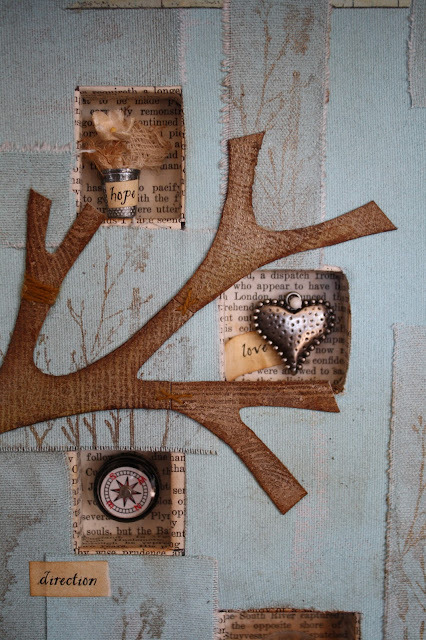 wow what a great idea is this, i am going to remember it and try to make something like this, i love it! thanks so much for showing the details of your piece of art - that's just amazing the way you did it all. and thanks for the inspiritation! going to go and find stuff to make my own version now!